I use your website from 3 different computers (german, english, swedish). My forms are in English and German translation. 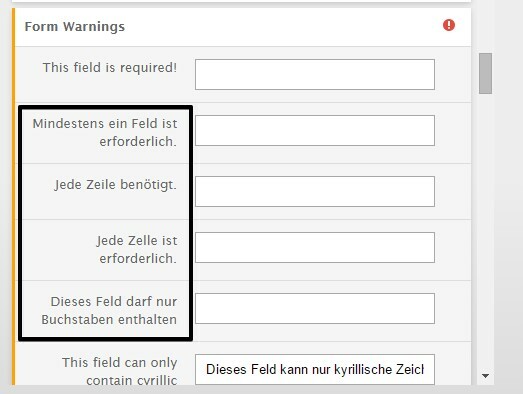 Now my form warnings (English) are mixed up in different languages. It would be good if one could choose a particular language for ALL form warnings and choose a language for the translation also. You already have the translation in your system, but I'm forced to manually write it in the translation, which could be inserted automatically. The translation for the field "This field is required" is not saved. When ever I open this window again, my previous translation is not there any more. I also tried a field for the email. It is the same error. I reseted my Firefox Cache, but it doesn't help. Please also note on the picture the different languages which I was talking about above. In other words, all the fields of your form should be entered in English first and then translated. 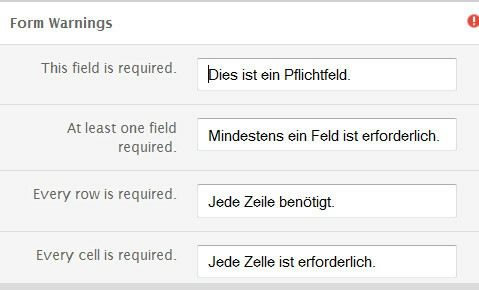 I see that there are fields in your form that were created in German language. Was the form created using the German website (http://german.jotform.com/)? No, I uses jotform.com, but the language of your website was sometimes different, depending on on which computer I was working. Sometimes English, sometimes German and Swedish. Then I figured out that I can choose the language and started using English only because of the errors above. I did the translation as in the tutorial. The Fields you highlighted are not created by me, but by your system, because this are Form Warnings. I suppose the used language of your website determines which languages the Form Warnings and other parts (as the calendar) are in. In this way I got an other form messed up with Swedish Form Warnings in an English form. Please read first message again. 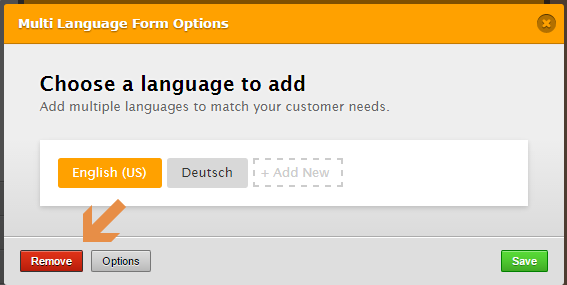 If your account default language settings is NOT in English, then the Form Builder will use that language. Please try first setting your account language to English and then create the form so that it will be in English by default. Then, you can use the multi-language tool to translate the form language. Hope this help. Let us know if still not resolve. 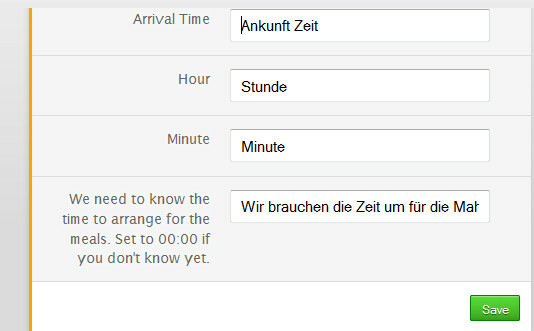 The setting was in English but before it might have been German and Swedish and English (becaue your website changes the language on different computers. Do you mean I shall delete my forms and make everything again??? You can't imagine how much time I spend to make it! Is this the only way? BUT it is not displayed on the form! 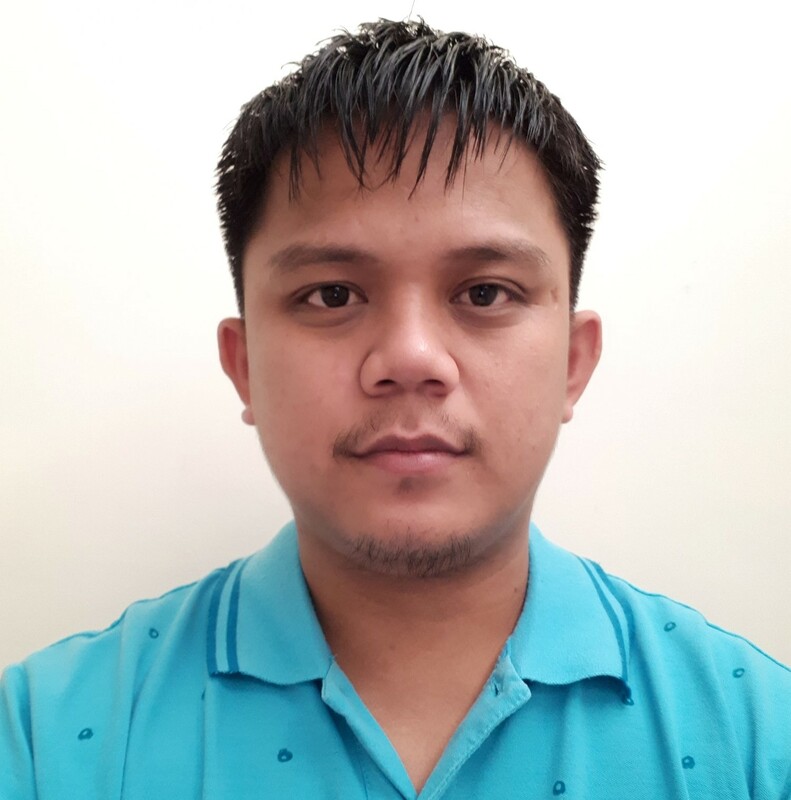 (becaue your website changes the language on different computers. I am sure it doesn't work this way.. if your account settings is set to English, then it will always be in English no matter which computer/browser you used. Do you mean I shall delete my forms and make everything again??? 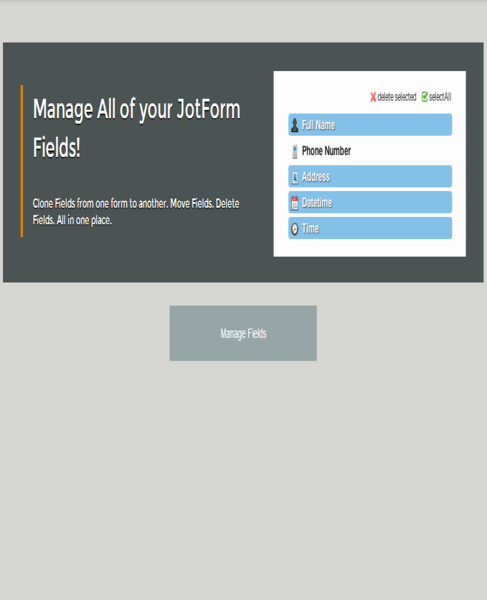 The Field Manager will allow you to transfer all the fields from one form to an empty form. And you will not loose them. You will have a new form created instead. Before using the Field Manage, make sure first that your accounts settings is using the English language. 2. Create an empty form. 5. After completing the transfer, open the new form in the Form Builder. 6. Check if you can now create the new translations needed on the new form. It took 5 hours to fix this. Notice "English" and everyting else is in German. See, it is in German here. In this way everything gets mixed up and problems occur like those I faced above. After spending 5 hours making a new form I still have problems with the translation. I removed the Date/Time field. I added it again and without even making a translation, the old translation was there. I'm so tiered of it! If you want to show a different message in hover text, I would suggest you to change the translation again and see if that solves your problem. I know. The thing is this text can not be changed or deleted! You can try to change or delete it if you want. But don't delete the whole form field now. I tried before. After deleting and inserting a new one, the translation was there again, without having written it. Your colleges did not believe me that one can have the Settings in English and the jotform website in German. There i show one can. All this might be the root of all this problems. I honor your attempt to help me! Our apologies for this issue. I saw the problem in your form and I can also replicate it in the clone version of your form. Will check this further and get back to you. 1. 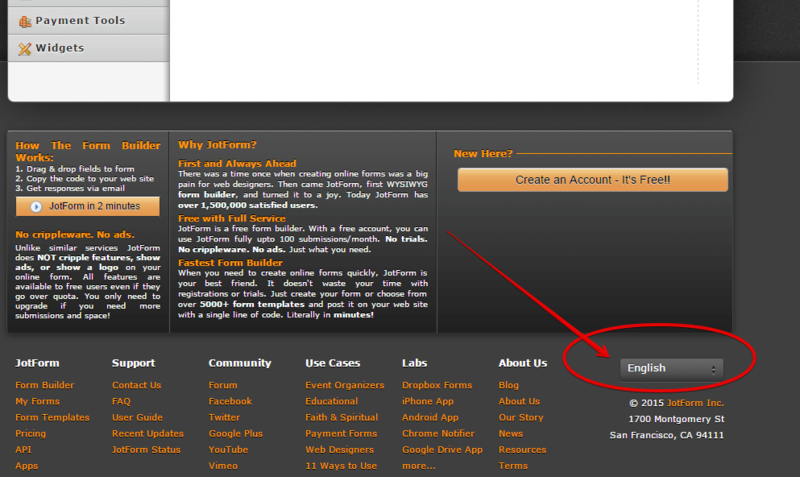 Access www.jotform.com and make sure that the website language is English (at the bottom part). Our website will detect your system and/or browser language and render it for you so you have to make sure that English is used. 4. Start over a new translation setting. I could then write the new translation, because it was empty. It still can't be changed after first translation. But this time I was wise and used a text which can be used at both places. But you should know there is something wrong with this translation thing. It would be good to remove the error for other users. I spend sooo much time with it, you can't imagine! Thank you for providing us with this additional information and we apologize for the inconvenience caused. We'll take a look at you've mentioned here: It still can't be changed after first translation. and report it to our back end team if necessary. Thank you for your patience and cooperation on troubleshooting this issue. There is no end to the bugs and errors! Now I can't translate the title of my form any more. And there is one more thing which is extremely irritating: Most answers collected from Widgets go into one column in the Excel export. It is extremely difficult to separate these into different column. And the headings of the question is also in the same column. This reduces the benefit of your service a lot! I spend like two weeks (not 2 minutes!) working with the forms and when it is done I check the export and see that everything is messed up there. There is a free Service which is called LimeSurvy, there are some bugs there, but the Export of data is excellent. You should check it out. There are several severe issues with the export. Apologies for the inconvenience that you are having. Could you try adding the translation again? I assume you are referring to the text field "- Program Registration Form -"? 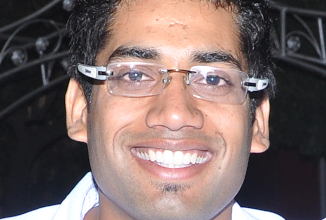 I've cloned your form for testing purposes: http://form.jotformpro.com/form/51396196296973?. In my end it translates. You could try cloning my form and use it instead if you're still unable to translate the original form in your end. For the other concern that you have regarding the excel report, I went ahead and made a separate thread for it so that we can discuss it better. Please refer to this link instead: http://www.jotform.com/answers/573400. We will address it shortyl. yes, now it's working. Thank you so much! Thanks to all of you from the Support Team. You are doing a great job! Thank you for updating us and confirming that all is good now. Feel free to contact us again anytime should you need further assistance.